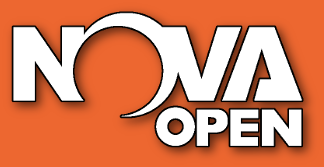 This past weekend Colin and I organized the Warhammer 40,000 Trios Team Tournament at the NOVA Open, our third year hosting the event. Trios is kind of an unusual format: Players register in teams of three. Each round two partner up with 1000pt armies for a doubles game, and the third plays a 2000pt standalone game. It’s a tough format to hold in a smaller scene because you need a bunch of players, but it works well at NOVA. 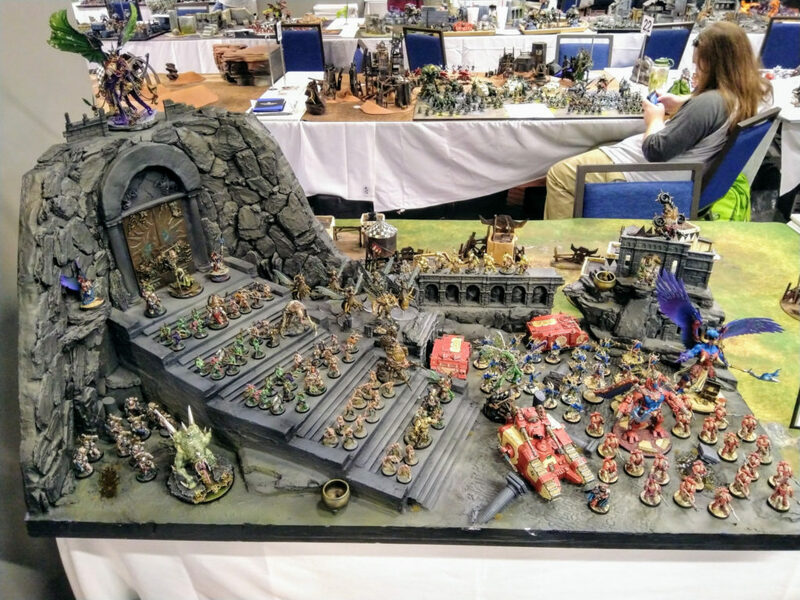 Somewhat uniquely, in addition to the usual painting competition, the event also has a strong theme component. 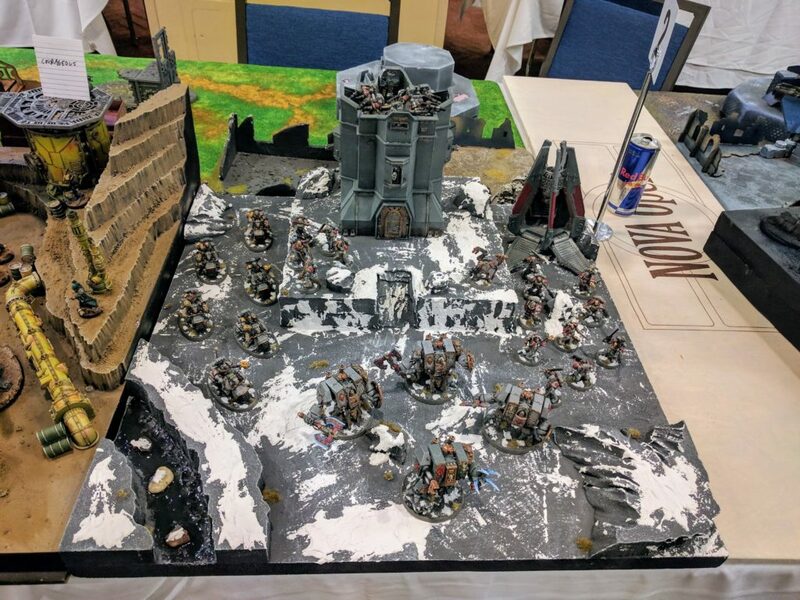 There’s a whole major prize category not strictly tied to technical hobby execution but just the storymaking and cohesiveness of a team’s assembled armies, and this is a huge component of the event for many participants. I think by all accounts this year was again a huge success. Three years ago NOVA expected us to get 8 or 9 teams and we got 18. This year we had 34 teams, 102 players! 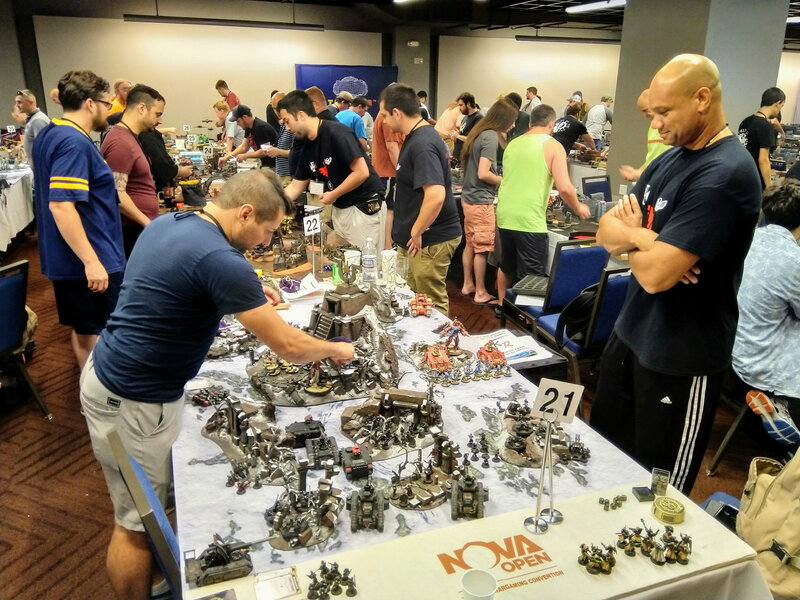 That’s largest event we have organized (our NOVA 40k Narrative has more participants overall, but not in any given round), and a legit tournament by any measure. Fortunately we had done just a bit of work to hone our processes a bit—such as improving our scoring spreadsheet to be faster to work with, and bringing in friends to help with appearance and theme judging—and it went very smoothly, meeting tight schedule constraints (I literally give out the last award, go to the bathroom, then come back to immediately kickoff the 40k Narrative). Many amazing armies were on display and in play, and for the third year running we had not a single sportsmanship report! More photos are in this Flickr gallery and this Facebook album. 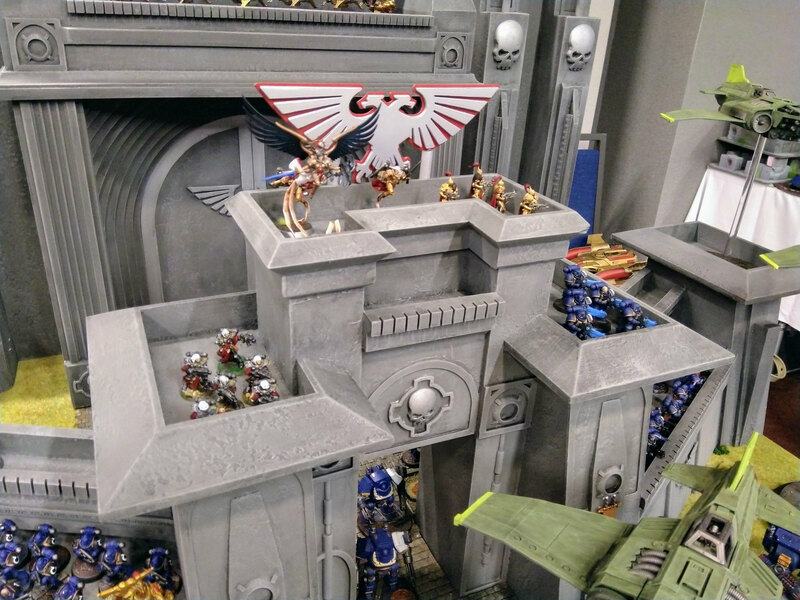 Greg Hess also has many 40K Trios photos in his gallery, as does NOVA in its convention-wide galleries, including podium shots. 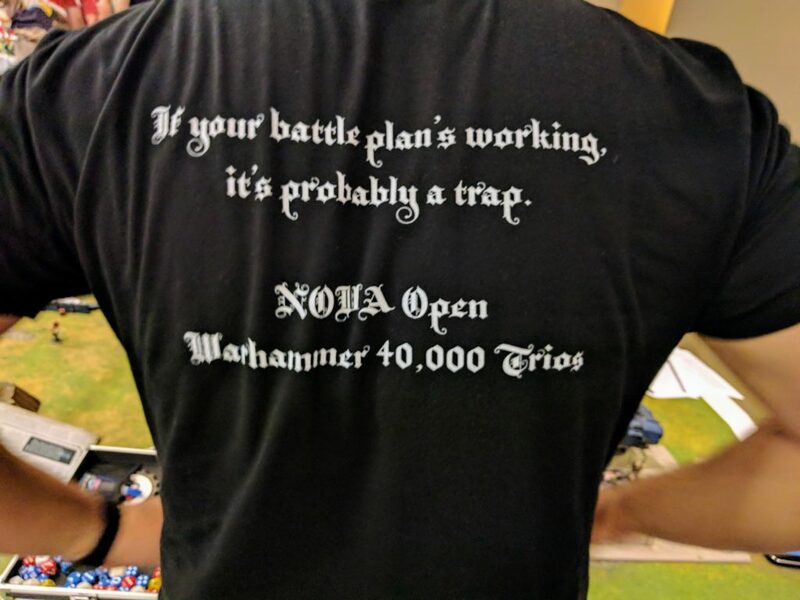 As discussed below, we have also launched a NOVA 40K Trios Facebook group for teams and players to share and coordinate. 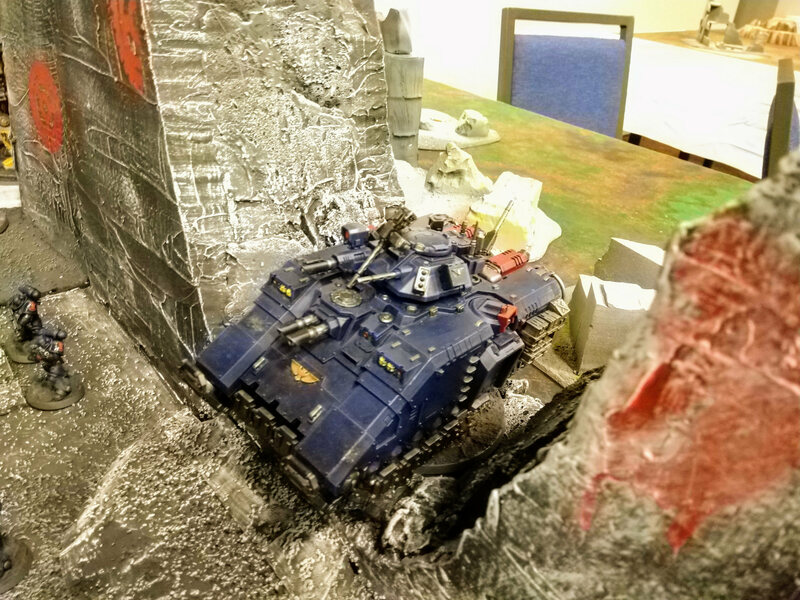 2018 NOVA 40k Trios underway. Sum total highest battle points, sportsmanship, theme, and hobby scores. Best combined theme, following the 40k Trios rubrics. Best painting and hobby work, following convention-wide NOVA rubrics. Most battle points (Vengeful & all teams being only eligible for a single prize). Highest scoring individual on our list of warlord achievements. These awards were deeply satisfying for me. Trios now has a really great community of players who’ve been coming back each year, and almost all of these winners are prominent parts of that. Phil & Patsy have lead teams to winning the theme competition twice in a row now and are really committed to it. Paul, Jessica, and David—better known as Team Warhammered—have previously won the Strategists title, were really close last year, and finally claimed the overall title this year, awarding their dedication in coming all the way from California. Best of all for me, my friends Fer, Jason, and Alex won the artistry competition (we have independent judges for that somewhat more subjective category in part because we have multiple teams of friends participating). It was really something to announce their title. Jason, Colin, and I first went to NOVA five years ago to play in the 40k Trios and the 40k Narrative, and Jason’s been chasing that artistry title ever since. Our good local friends Lovell, Tim, and Carlo of the Crew Shaken podcast also claimed second place overall, a huge achievement in a big field. Lovell got me started in 40k many years ago when he gave me a couple sprues of 2nd edition Tactical Marines, a metal Champion to use as a Captain, and talked me into some demo games. Just look at us all now—organizing some of the biggest events at a premiere convention, and placing in true competitions! All this was icing on an already good event. One of Alex’s many nightmares. A story, told by video in their case! 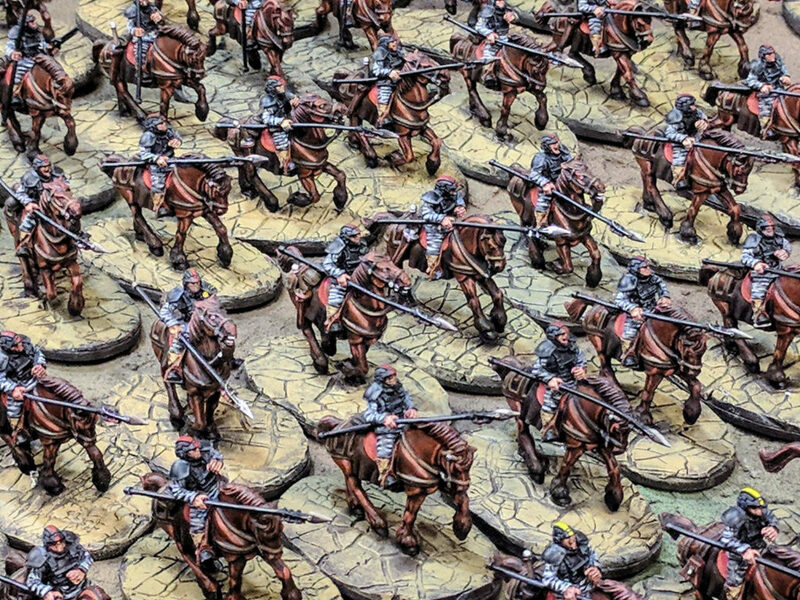 Notably, “cohesively painted armies” doesn’t mean all sharing the same paint scheme. What it does mean are things like figures’ basing roughly matching each other and the display board. Many top entrants over the years, including this one, have also had matching campaign badges on all of their major figures. The theme competition also doesn’t strictly relate to technical execution. Team Quarrelsome always has excellent models and great display boards. This year though I thought at least one display board exhibited better technical mastery, a stunning piece of terrain work. But this competition is about having and presenting a narrative through a bunch of different elements, and Quarrelsome nailed that holistic storytelling and group presentation once more this year in a tight competition–the theme track was hotly contested and the title basically came down to having team flare or not. Campaign badge on one of the Knights. Second place theme finishers Team Courageous made an incredible fortress gate for their display. Grand scale like this is always compelling, but what’s really amazing is how crisp all of the elements are when you look closely. 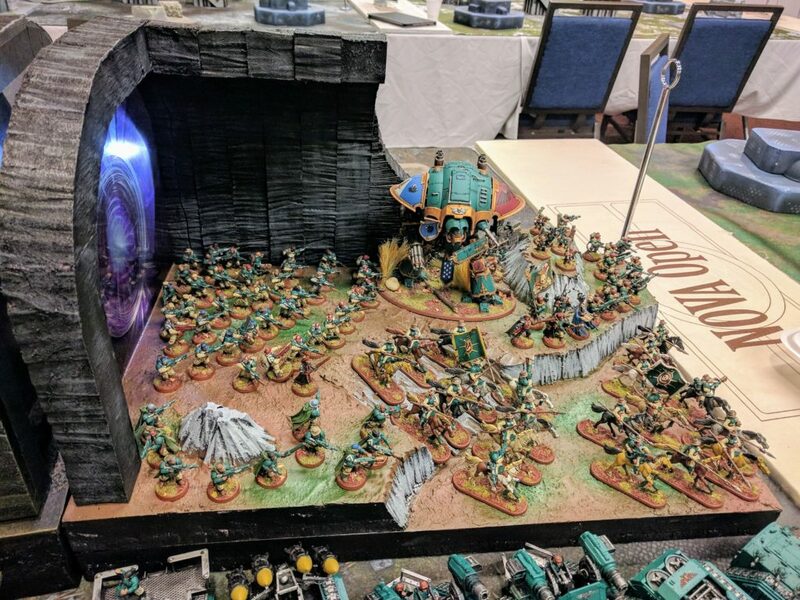 This is masterclass terrain building among the best I’ve seen, and will no doubt go on to be an amazing centerpiece display for their local shop. Courageous also had a great handwritten book for their story, and only lost out on the Storytellers title by a couple points. Incredibly crisp terrain work, carried out on a large scale. 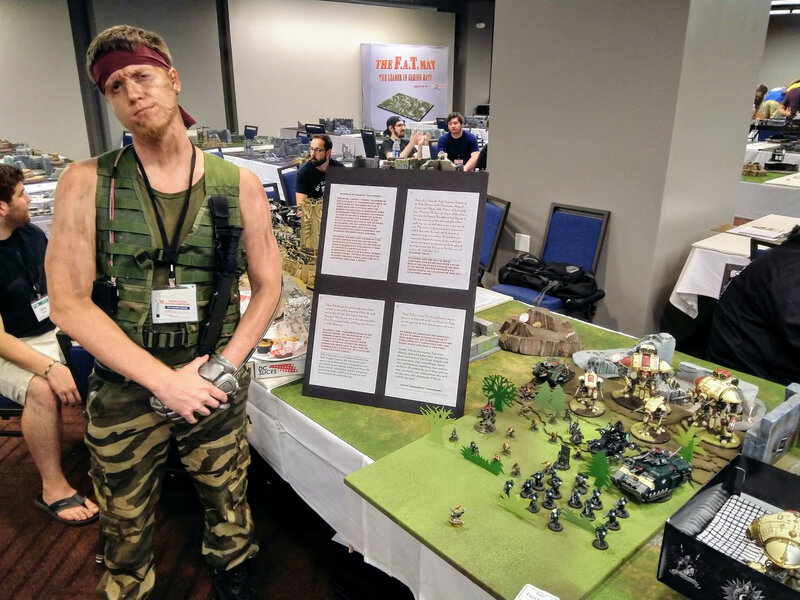 One nice touch this year complementing all these great armies and themes is that one of the 40k Narrative players (Chris Stover) brought in a literal truck full of high quality terrain. Combined with a few boards by my friend Matt and I, we had a large number of comparatively fancy layouts. They varied quite a bit in type and density though. So we split the field, with the more competitive top half playing on standard NOVA GT competition-oriented setups, and everybody else playing on the narrative terrain. I hope to do something similar again next year. Rebalancing points. Given the focus of most teams, we’ll likely shift the ratio of points toward the overall scoring to being more equal across the categories, increasing those for theme and hobby work versus match results. Freshening up the missions. 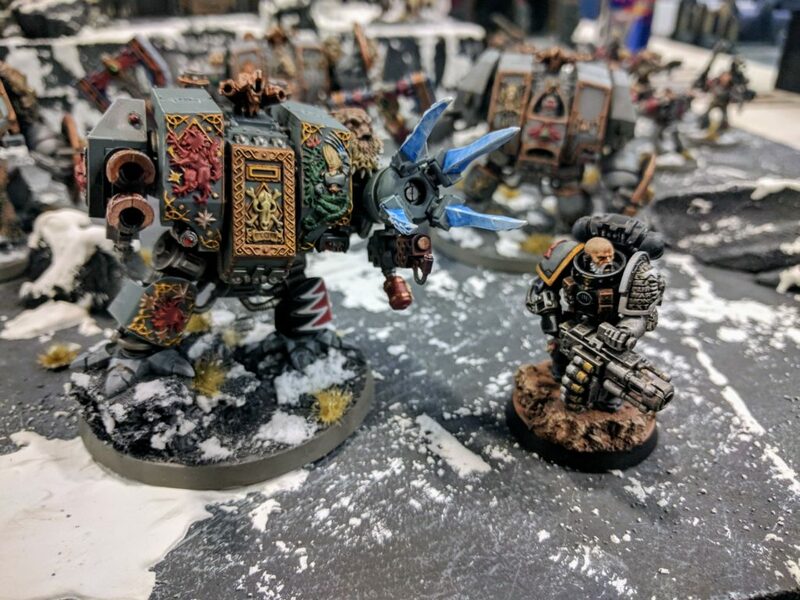 In particular, I would expect the Open Ground mission and some of the secondaries to be replaced or tweaked to be more interesting and more in line with the general feel of 8th edition 40k. New warmaster achievements. We talked about replacing these for this year, but didn’t come up with a system we particularly liked. Fortunately, this year’s warmaster was indeed on a team that did not win one of the other prizes, as we more or less hope, despite strong competition from several of them. Regardless, we have some ideas coming out of this NOVA that we will work on to improve this aspect of the event. The goals here are two-fold: Make a broader slate of warlord units viable for the competition, not just the more aggressive types; and better decouple the achievements from winning games, so even players struggling to win matches might go for the warlord title. Better highlighting of the army displays. 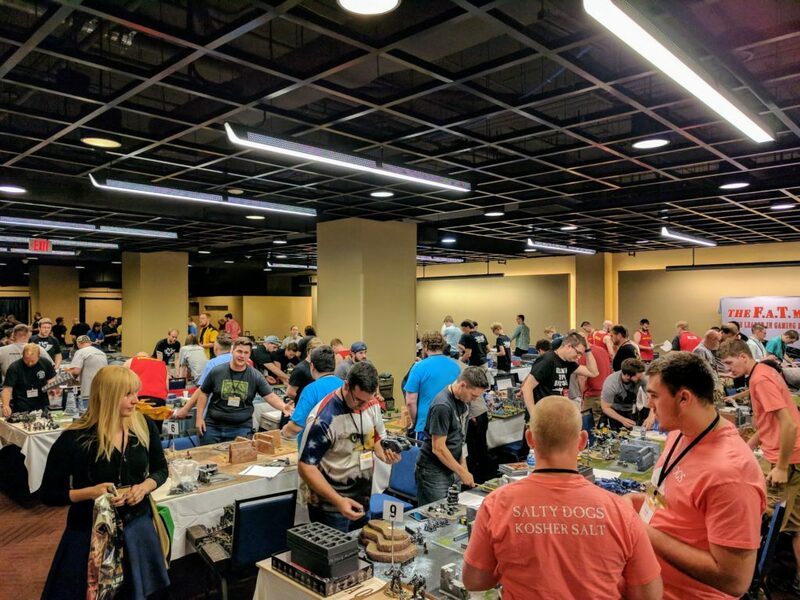 A lot of players are putting a ton of time into the hobby aspects of the competition, particularly the themes, which is amazing. So we would like to dedicate more visibility to those efforts than the hour of judging they currently get. 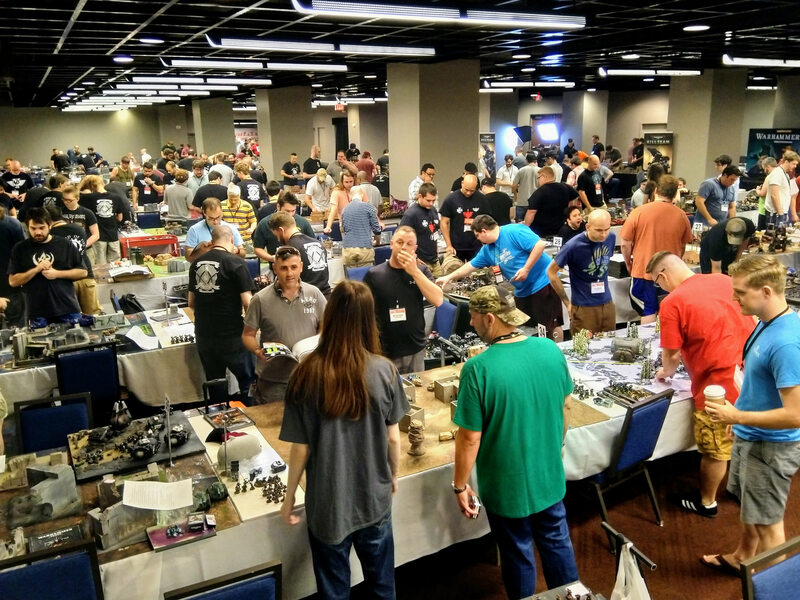 In general space is at a premium at NOVA, but unless additional events are slated for Thursday next year we might be able to coordinate with the convention’s operations leadership for tables dedicated to putting armies on display. The bigger issue is time. We would love to spend more like two hours with the boards on display, and maybe even make a real social gathering of it. But we don’t want to start much earlier in the day given that many teams are arriving at the convention either late the night before or that morning. And we can’t end any later without also adjusting the 40k Narrative. So this will take some real thought. One half-wild, half-plausible idea is to have the final round cut to the top 8 or so teams to battle it out, and everybody else have a social gathering with food, beverages, and army displays to kickoff NOVA. 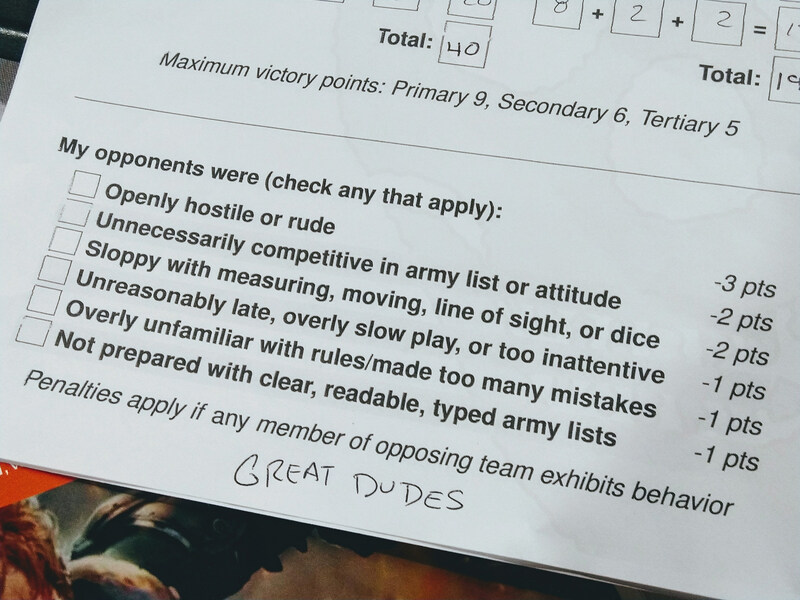 Display board rules. 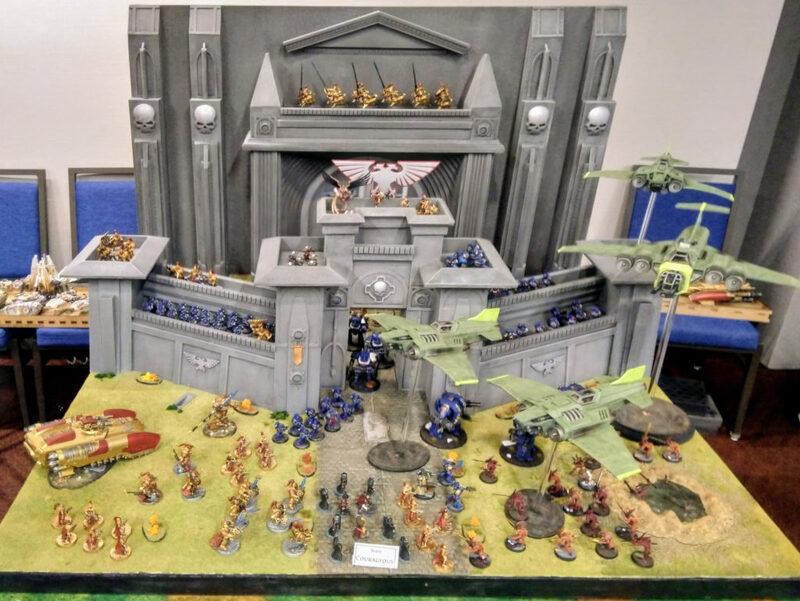 All that said about giving more attention to the themes and displays, expect some basic rules placing a limit on how big the display boards can be, before things get further out of control. 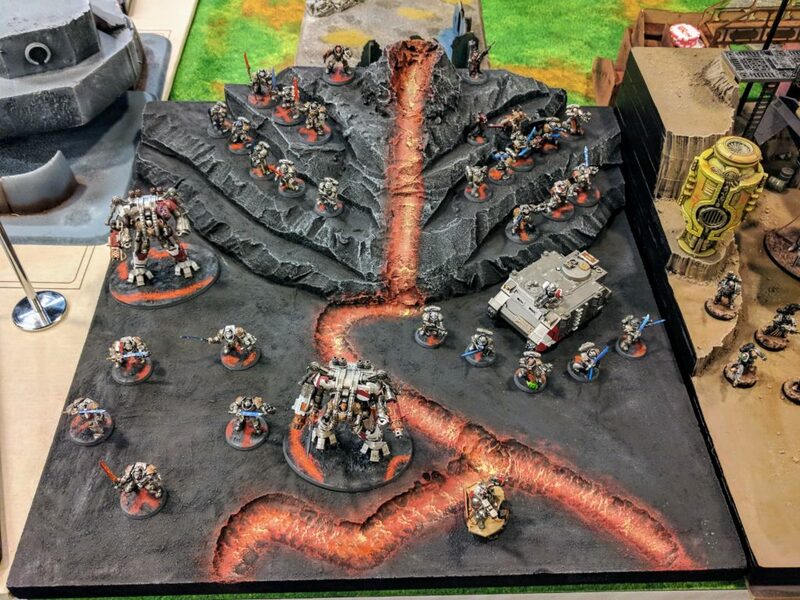 On the other hand, it’s possible we’ll add a benefit for making a playable board which we can use throughout the weekend for the 40k Narrative. Several teams coincidentally did so this year, and it was really fun. It would also be an interesting challenge to make the boards good at both displaying armies, and being a good battlefield. 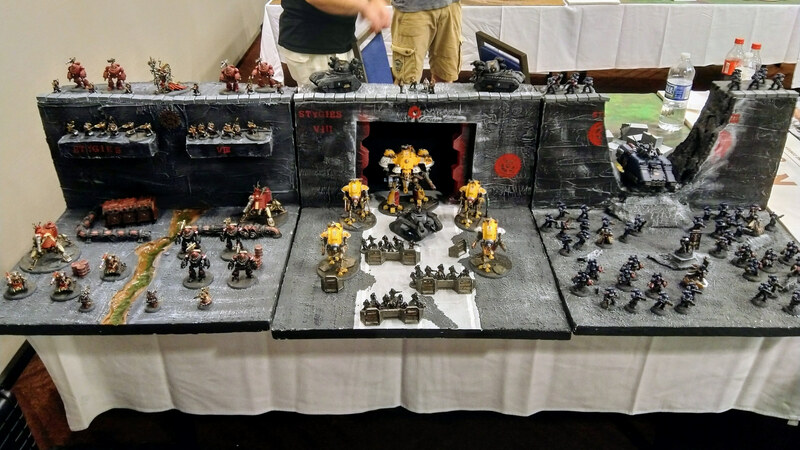 Obviously this is also working against having size restrictions, but a possible compromise is encouraging display boards that include sections appropriate for playing Kill Team. Comments and ideas on all these topics are extremely welcome (in comments below, on the NOVA survey, or please feel free to email). 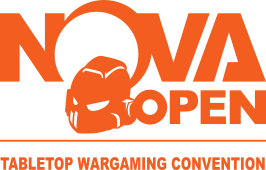 One small but important step we’ve already taken for next year is to create a NOVA 40K Trios Facebook group. 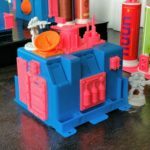 We hope this will become a fun community forum to display their team projects from this year, share their progress on projects for next year, and to coordinate. Fielding a trio can be challenging. It might be hard to find three players to come to NOVA, and if any one of a team’s members have something come up then they’re all out of luck. So we hope this forum can provide some support for potential players to find each other and form new teams, and for teams to reach out for replacements on short notice when members have to drop. Please join us! That’s a wrap for another year. Full results are available here (XLSX). Many more photos of all the luscious armies and great displays are in the Flickr gallery and the Facebook album. 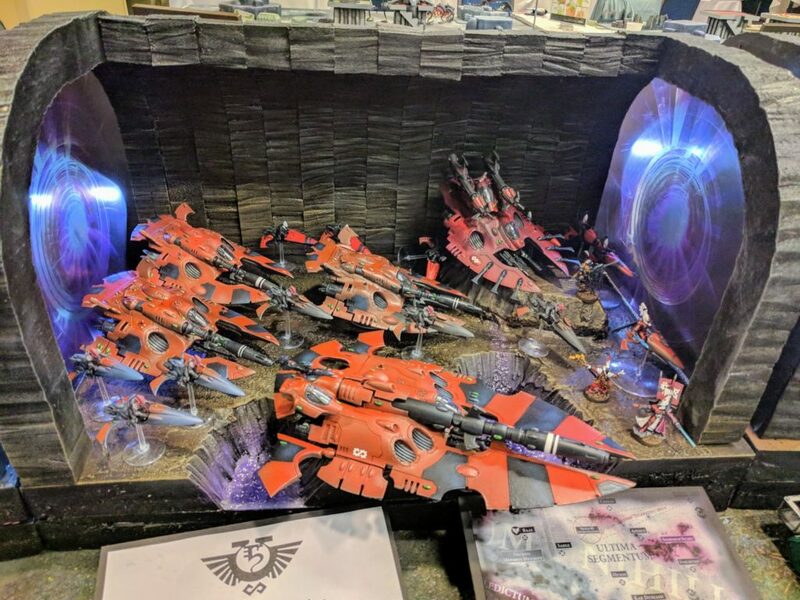 Greg Hess also has many 40k Trios photos in his gallery, as does NOVA in its convention-wide galleries, including podium shots. 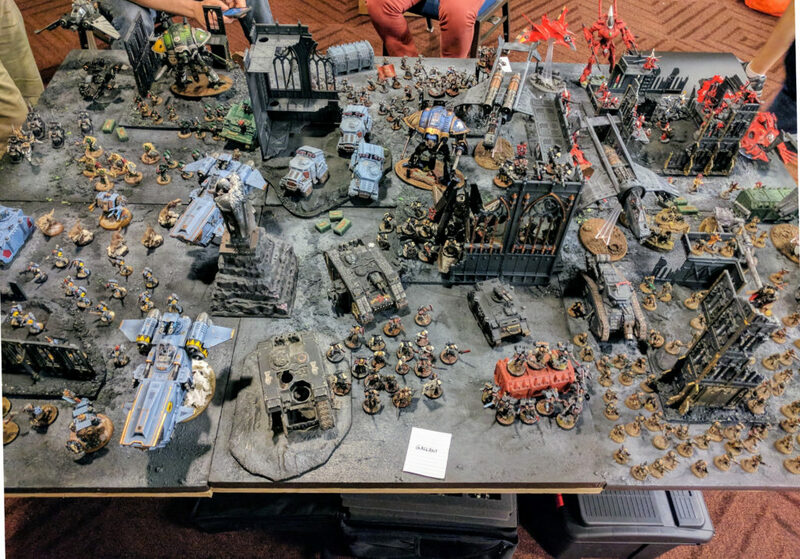 The NOVA 40k Trios seems to have again gone very well this year, and I personally enjoyed it quite a bit. We hope you all enjoyed it too! We expect to continue most of the main ideas for next year, but have some thoughts in progress to make it even better, a topic on which we welcome your feedback. See you next year! We have a great group of competitors. 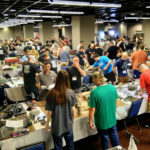 Questions about army list building in Warhammer 40,000 8th edition continue to come up as newcomers join the hobby and old heads return. So I’m going to write my explanation about detachments, Battle Forged, and so on here just one more time and then link to it in future conversations. Corrections and questions are welcome. For Matched Play, the most common 40k 8e format, armies must be organized into detachments and all units across the entire army must have at least one faction keyword in common (e.g., Imperium). Additional buffs are available for detachments (not armies) drawn from single codexes or factions (e.g., Space Marine chapters). My impression is that most players are generally using the Matched Play format, as opposed to Open Play, Narrative, or something else ad hoc. I could be wrong about that in general, but it’s certainly true of pickup play around my local scene (Redcap’s Corner) and all the tournaments I have seen (and run). So the default is that you’re selecting armies by points, not power levels, and adhering to Matched Play format. Hampering newcomers in hunting down rules is that Matched Play is actually more restrictive than Battle Forged. Many people implicitly assume Battle Forged is more fluffy and limited. That’s not the case. Matched Play is a subset of Battle Forged, not the other way around. 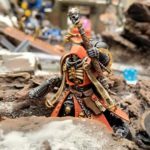 Competition-oriented Matched Play and some newer rules additions from the codexes and upcoming Chapter Approved supplement actually do more to encourage armies more similar to traditional Force Org Chart, no allies, old-school 40k. Battle Forged by itself is more open. 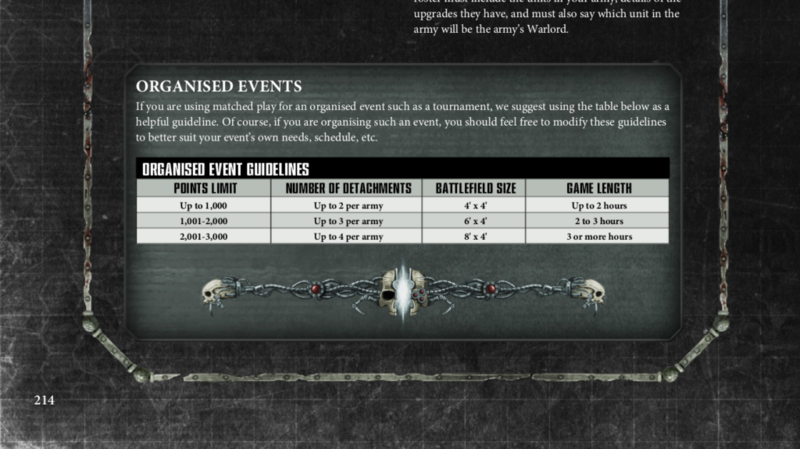 Matched Play requires that your armies be Battle Forged (main rulebook page 214, top left). 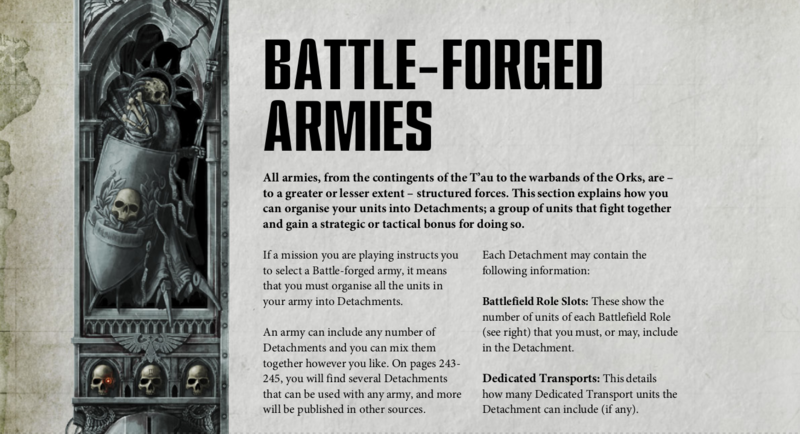 Battle Forged requires your entire army to be organized into one or more detachments (main rulebook page 240, top left). Beginning of the Battle Forged rules. Detachments in theory are wide open, you can put any mix of units in there. However, in practice all of the units within a detachment must share at least one keyword. All of the detachments in the main rulebook such as Patrol, Battalion, Outrider, and so on either explicitly impose that restriction or are limited to a single unit. The only exception is the Fortification Network, which permits multiple fortifications with no faction restriction. There are some faction specific fortifications out right now, such as the Tau Tidewall, but most published so far are Unaligned (the commonly seen ones are all in Index Imperium 2), and this is mostly a small side point anyway. Unless I’ve missed something, no other detachments have been published or rumored. So, in the future some supplement or such could perhaps have a detachment that permitted you to include Orks and Imperial Guard within a single detachment. However, you cannot do that within any of the detachments that currently exist because those units do not share any faction keywords. What you can do though is, for example, make up a detachment of Imperial Guard and Ultramarines units, because those all share at least one faction keyword (Imperium). In addition, under Battle Forged rules alone, your army could straddle factions across multiple detachments. You could, for example, make up a Battle Forged army that had two detachments of Imperial Guard and one of Orks. There are no rules for Battle Forged armies linking the detachments. However, Matched Play prohibits that by imposing such a linkage. 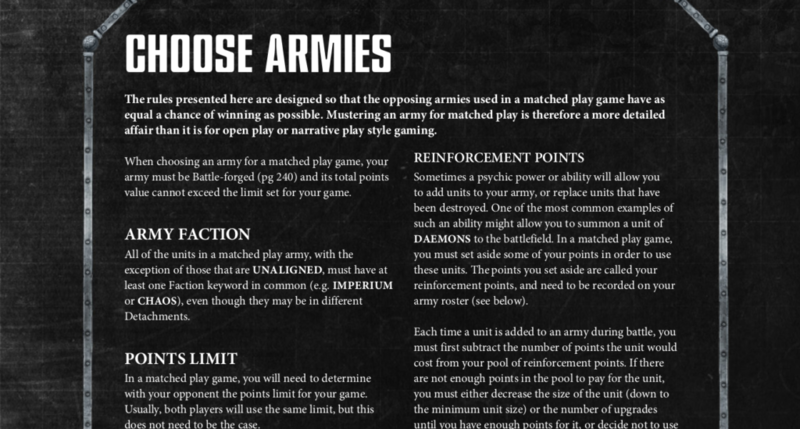 Matched Play requires that armies be Battle Forged and that all units have at least one faction keyword in common (main rulebook page 214, under “Army Faction”). 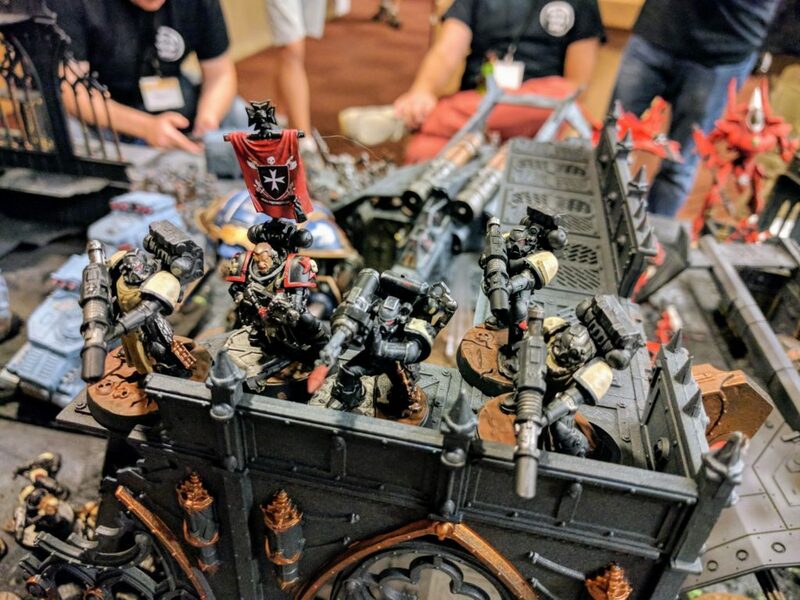 So, in a tournament or pickup play using Matched Play rules, you could not field an army with detachments of Imperial Guard and Orks even though it was Battle Forged. 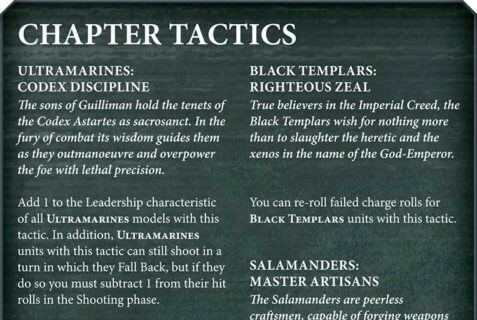 You can however still mix Imperial Guard and Ultramarines units within and across detachments, because those all share at least one keyword. Beginning of Matched Play rules. New rules from the codexes released to date as well as the upcoming Chapter Approved supplement however encourage—but do not require—detachments drawn from a single faction by offering at least four types of buffs for doing so. The codexes seen so far all have rules, such as the Space Marines’ Defenders of Humanity, that give a scoped but important buff to models in a detachment comprised solely of units from that codex: They trump other models for control of objectives. The Chapter Approved supplement will provide a similar rule, Objective Secured, for all the factions that still only have Indexes. Most events seem to be adopting this and the other updates to Matched Play from this supplement that have been officially previewed. 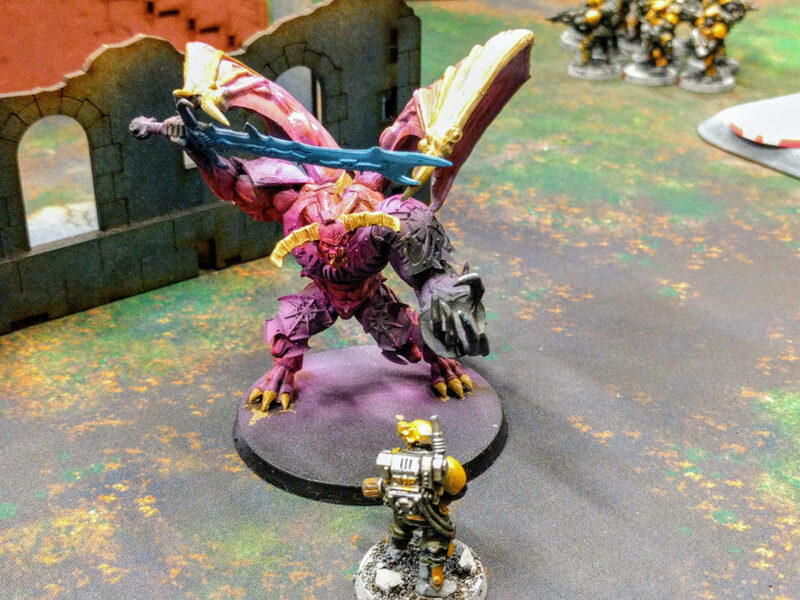 There’s a reason GW rushed out these rules previews just in time for the first really large 40k event under 8th edition (NOVA): They address a number of balance issues, particularly as the codexes roll out. Preview of Objective Secured rule from the upcoming Chapter Approved. Similarly, codex stratagems are unlocked by fielding at least one detachment comprised solely of units from that codex. So a detachment made up of Imperial Guard and Space Marines would be Battle Forged, share a keyword, and be legal in Matched Play, but by itself it would not have access to either of those codexes’ stratagems. That’s a severe penalty for mixing the factions given the utility of some of those, so it’s another strong incentive to field uniform detachments. 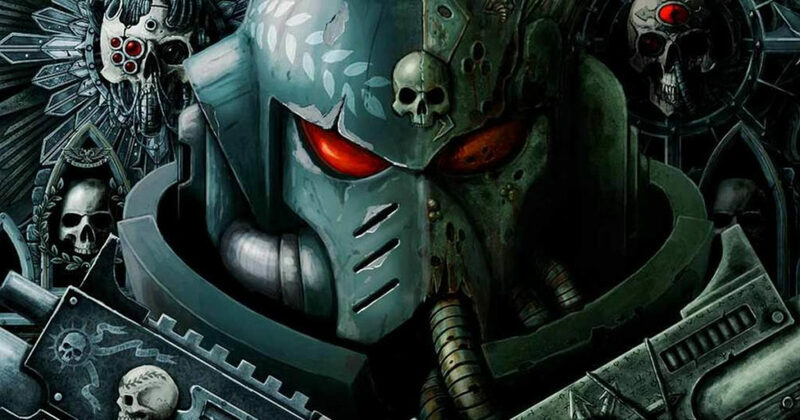 All of the codexes released or previewed to date have also granted additional unique benefits to detachments comprised solely of particular factions: Space Marine detachments made up of a single chapter receive an associated Chapter Tactic, Grey Knights have a Chapter Tactic in Brotherhood of Psykers, and Chaos Space Marine legions all have their own benefits. Future codexes will grant similar unique benefits to detachments made up of specific regiments, dynasties, forge worlds, clans, etc.. 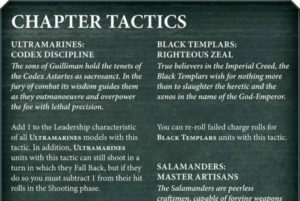 Some of the Space Marines’ Chapter Tactics. Finally, most unit special abilities affecting other units are also compatible only with the most specific factions. Transports in the mainline indexes and codexes can only embark units drawn from the same chapter or that codex’s equivalent. Captains, honor guards, ancients, and similar generate aura buffs only applicable to units and models from their specific chapter or equivalent. There are some notable exceptions, such as Guilliman, who provides an aura at the Imperium level. But in general while detachments made of various factions under an umbrella faction are valid in Matched Play, their units will be limited in how they interoperate and support each other. In some sense this incentive is not very strong. You might only be planning on those units interacting with a few other units anyway. But unlike the Objective Secured and Chapter Tactics type buffs it is diffused across the entire army, creating a soft linkage between detachments: Sure would be a bummer if at some point in a game a unit in one detachment really needed to embark a transport or receive some buff from a unit in another detachment but couldn’t because they were of different factions (detachment boundaries alone do not impair such abilities). So the tighter faction scoping of most unit abilities in this edition also gently encourages focusing on one or a limited number of factions, even between detachments. By and large though the explicit faction-focus benefits so far are primarily encouraging uniform detachments, not armies. You could still mix factions between detachments, provided they all have at least one shared faction keyword, and get these buffs. So, as long as our example Imperial Guard and Ultramarines army was organized into detachments each with uniform faction, they would all have Objective Secured or Defenders of Humanity respectively, access to their stratagems, the Ultramarines would get their Chapter Tactic, and when their codex arrives the Imperial Guard will get some benefit associated with the chosen regiment. Matched Play rules therefore impose basic requirements prohibiting very unfluffy combinations. You can’t field Orks and Imperial Guard together. But within a larger alliance such as Imperium or Chaos you have a great deal of flexibility, certainly across an army and even within detachments. However, there are multiple strong incentives for focusing detachments at least on particular specific factions. Unit level interactions and combos are also much more constrained. 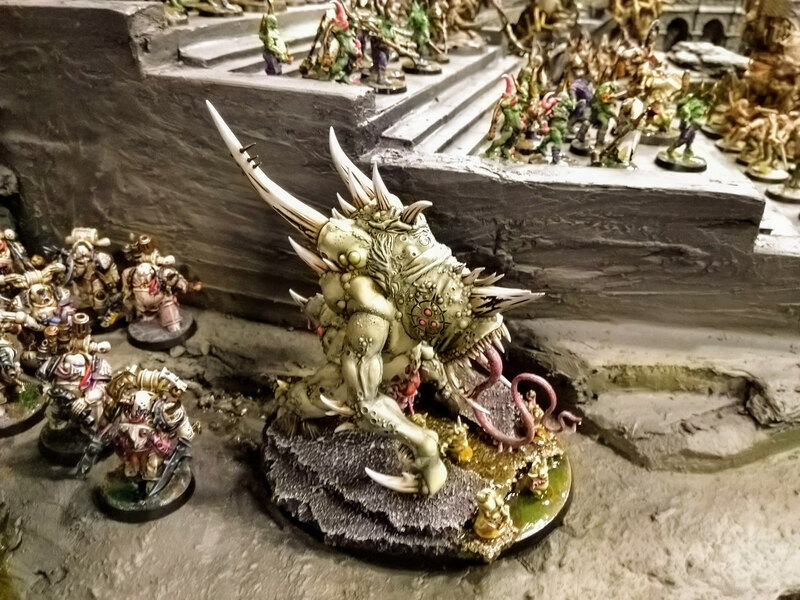 Taking all of these rules together, in 8th edition you won’t see anything nearly as crazy as the allies permitted in the recent prior editions, and many armies will in fact be very traditional. One last general note is that most events are limiting the number of detachments that may be taken. Matched Play provides a table of suggestions (main rulebook bottom of page 214) which have been widely adopted. So at the new standards of 1500 or 2000 points, armies are generally restricted to 3 detachments. In sum, the rules for allies and army organization in Matched Play are somewhat confusingly presented as they’re located in a variety of places throughout the 40k main rulebook. But in practice they’re pretty simple: Armies must be made up of detachments, every unit across an army must be from the same general faction, and there are buffs for detachments selected from a single specific faction. 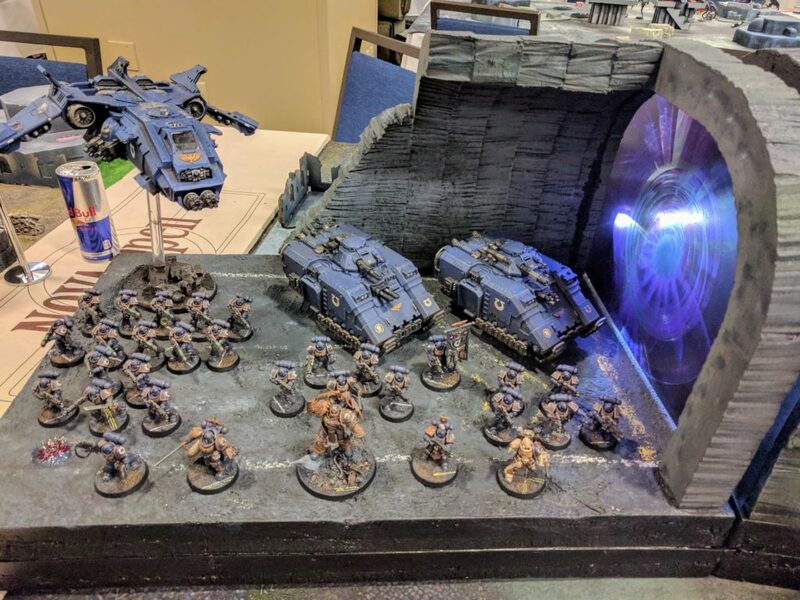 It is a detailed rules design topic not especially applicable to actually playing, but this post discusses duplication and ambiguity problems in the rules around Objective Secured and Space Marine Detachment. 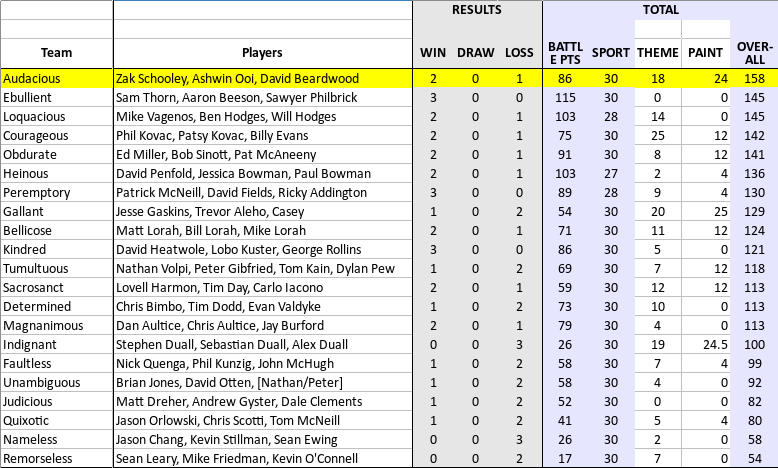 Colin and I headed up the NOVA 40k Trios Team Tournament again this year. We had 21 teams for 63 players, up from 18 teams last year. Trios features a somewhat unique format, in which teams of three play a doubles game and an individual game against an opposing team each round. It really only works at a large event like NOVA because of how many players are needed to have a good number of teams, but it works really well there. It’s a great way to start off the convention because you spend the whole first day hanging out and playing with friends. This year seemed to be a big success, continuing on from last year’s well regarded event overhaul. As mostly expected, Warhammer 40,000 8th Edition seems to be holding up well to large competitions. We had extremely few rules questions come up and they were all easy to resolve. There were of course some powerful units kicking around, but no grumbling about specific units and armies at anything approaching the scale of last year. Games Workshop also again donated really awesome trophies for our top team. In addition, something I especially appreciated as someone who takes a lot of photos and spends almost literally 4 straight days at NOVA staring at games, TABLEWAR donated F.A.T. Mats to cover all the tables. Combined with numerous excellently crafted armies, the visual appeal of all the games was really high this year. Many more photos from the event are available in the gallery here. 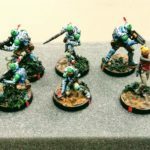 2017 NOVA 40k Trios underway! Open Ground: Controlling markers, choosing to score continuously or game end. Slaughter Zone: Our take on Annihilation, using percentages of units killed. Battlefield: Players choose from several primary objectives to either hold specific markers, kill enemy units, or preserve their own units. Each of those missions also has a selection of secondary objectives, enabling players to either double down on the primary objective style or go for something else. For example, an army good at holding ground might choose a secondary to claim terrain pieces in addition to the objective markers, while an army better at killing units might choose a kill points secondary objective. 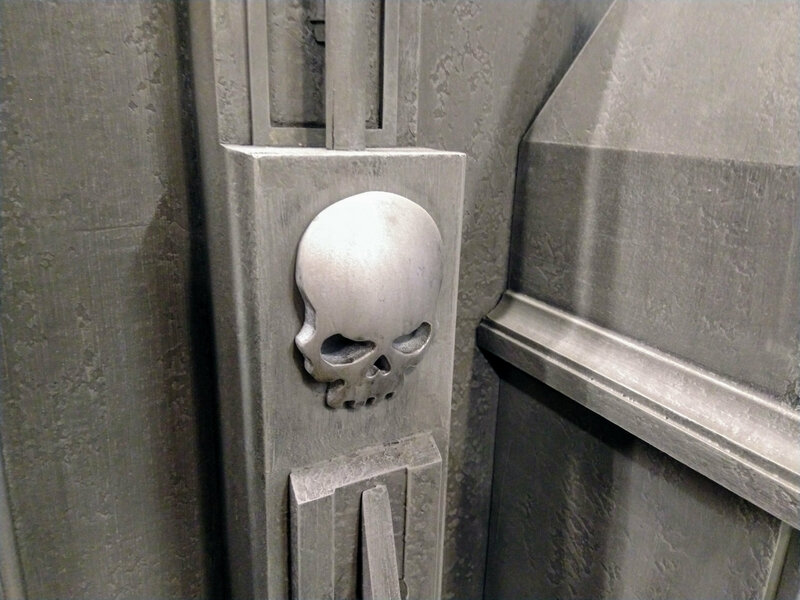 In addition, special to the 40k Trios and our local annual Tournament of Blood, each player is working toward a set of ten Warlord Achievements each round. These award the head of the army for personally capturing objectives or slaying enemies. The full event primer with missions and details is available as a PDF here. Rough Riders are apparently a thing now, there were several armies of them! Renaissance Trios: Overall winners across battle points, sportsmanship, craftsmanship, and theme. Strategists: The team with the most wins and then battle points. Artists: Best painted team as judged by NOVA/Capital Palette painting judges. Storytellers: The most original and best presented story of why a team’s forces are fighting together. Warmaster: The individual who scored the most Warlord Achievements. Renaissance: Zac Schooley, Ashwin Ooi, David Beardwood. Artists: Jesse Gaskins, Trevor Aleho, Casey ? Full results are available as either XLSX or PDF. Everyone, even the simplest soldier, has at least their life to offer the Emperor. Lots of teams really get into the narrative aspect of why their teams are fighting together, making extensive writeups and display boards. We very much enjoy seeing that effort each year, especially as it was our primary interest when we were Trios players. There were many great displays this year, so please check out the photo gallery. But four teams came up tops in our scoring matrix (detailed in the primer). 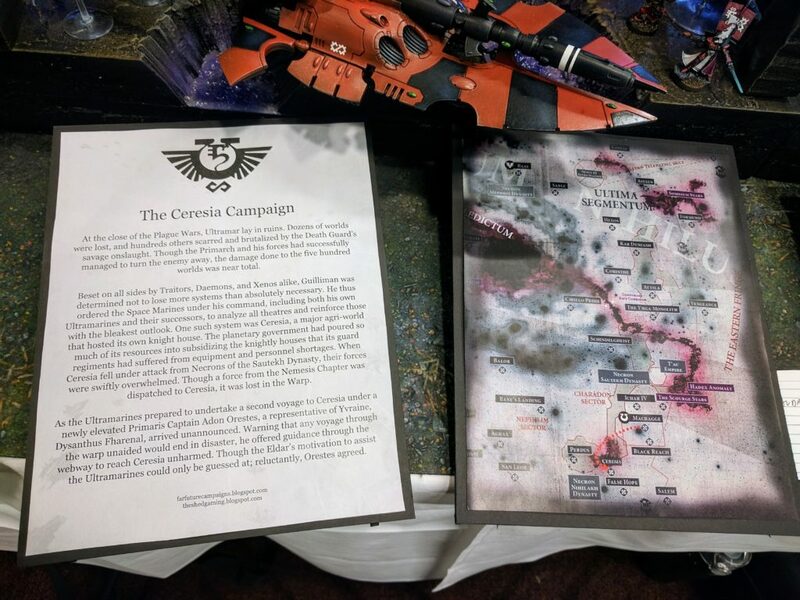 Team Audacious, our eventual overall winners, had an amazing, cohesive display of an Eldar force escorting Ultramarines through The Webway to reinforce Imperial Guard under Necron siege in their Ceresia Campaign background story. 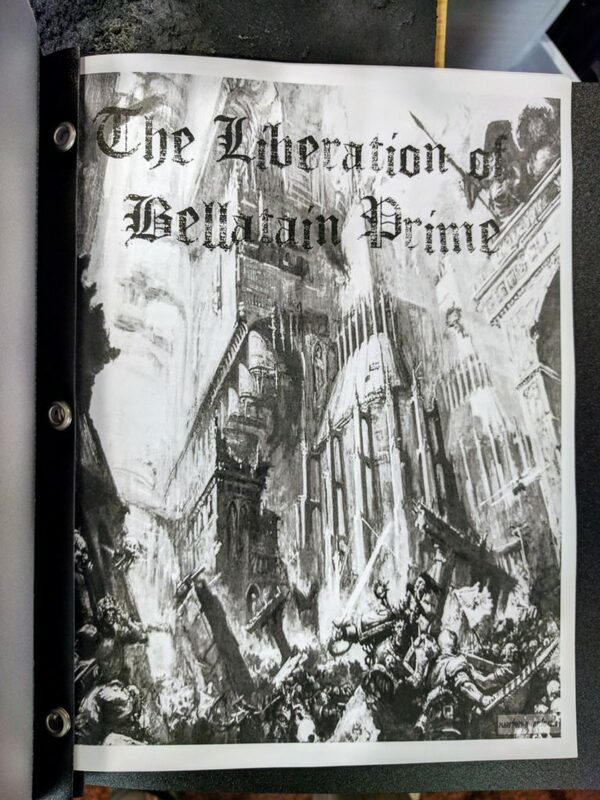 Teams Gallant and Indignant, last year’s theme winners, again had an extensive writeup and display for their Liberation of Bellatain Prime storyline. But our Storytellers title went to Team Courageous for their Crystal V and Hive Hyatt Prime storyline. You can read their introduction here. The competition was really close between all four of these teams, but what put Courageous ahead were three totally aligned factions and small details tying the armies and story together, like HQs having campaign shoulder pads shared across the armies. This year’s event again though featured numerous incredible army displays in addition to these. More photos are in the gallery. Overall I think the NOVA 40k Trios is working well. Major changes for 2018 aren’t expected, mostly procedural tuning and the usual mission rotation and tweaking. However, a few larger changes come to mind. One possible addition are small buffs to help the second player defend against a first turn onslaught. That needs more thought, testing, and consensus building as 8th edition continues to shake out, but it sure seems like among most players the first turn is perhaps overly strong. A return of tertiary points for killing Lords of War is also probable. We kept those in the Narrative this year but tested Trios without. We’ll probably also adjust Sudden Death and Boots on the Ground to also include Lords of War with the Fly keyword, or a similar ruling. Their technical exclusion from the errata for those rules came up in both 40k Trios and 40k Narrative, and I think goes against their intent and is probably inadvertent. Another great army display, from Team Sacrosanct (CREW SHAKEN!). The most significant potential change on the docket right now is a very different slate of Warlord Achievements. Both years now the Warmaster title has gone to a player on the Strategists-winning team. To some extent that’s not surprising and maybe inevitable. However, the current set of achievements encourages that by being goals you generally want to attain anyway, like slaying the opposing Warlord. It would be interesting if the achievements were just enough off track that you had to make a stronger choice between playing toward the mission or the achievements. 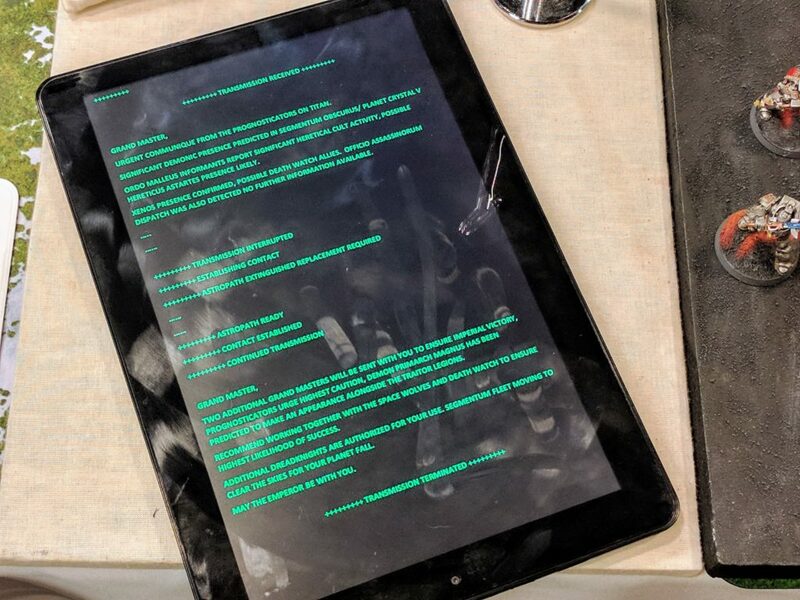 We’ve thought about this idea a fair amount and haven’t yet come up with anything which we didn’t think was either overly complex or too distracting from the main mission, but will put more thought into it. It would be great for this title to wind up landing in another team, much like how we’ve seen a good spread among the team titles. These are all somewhat minor issues though. It was another great year for the 40k Trios, and I look forward to yet another in 2018. 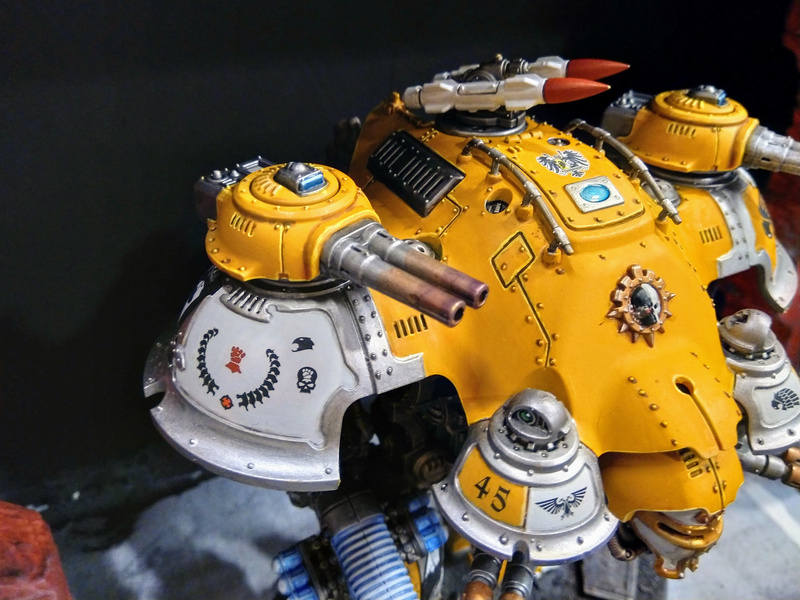 Don’t forget to check out all the other awesome armies in the gallery! 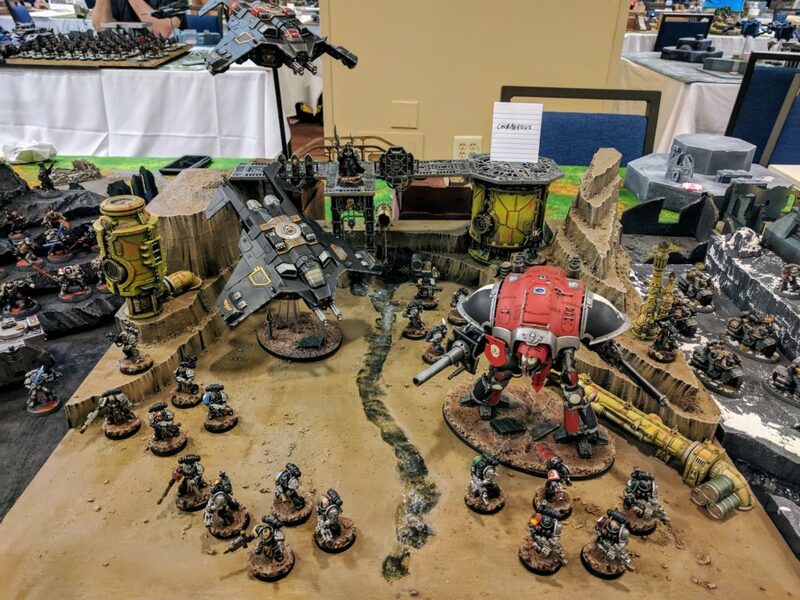 UPDATE: Greg Hess also has pictures up of the 40k Trios. One of the team shirts, dispensing important advice.